In case you think you happened upon a group of girls who have nothing to wear but purple…let me explain…. These are just some of the sisters of faith! 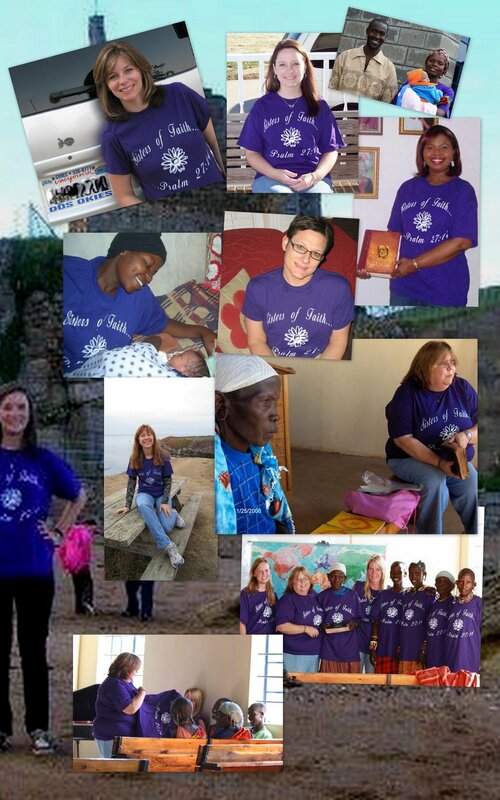 Marsha—from Marsha’s Musings graciously took 24 shirts to Africa–(click on the picture to get close ups) and there is one taken in Scotland…we have a couple Sisters of faith ambassadors in California (or more), Wisconsin, Florida, Alabama, Georgia, North Carolina, Tennessee, Texas, Oklahoma, The Bahamas, Arizona, Virginia and Idaho. I may have forgotten a few. Some are pictured…some are not. POINT IS…we are sisters. No matter where we come from—what color we are—what denominational tag we wear…we have the same Father in heaven and the same passion for living our lives out for HIM. We began this journey of faith long ago—at the teaching from our mother. Many “sisters” may have just joined in the journey. No matter the when or where—we sojourn along. Together. Lifting the heart of one another. As best we can. 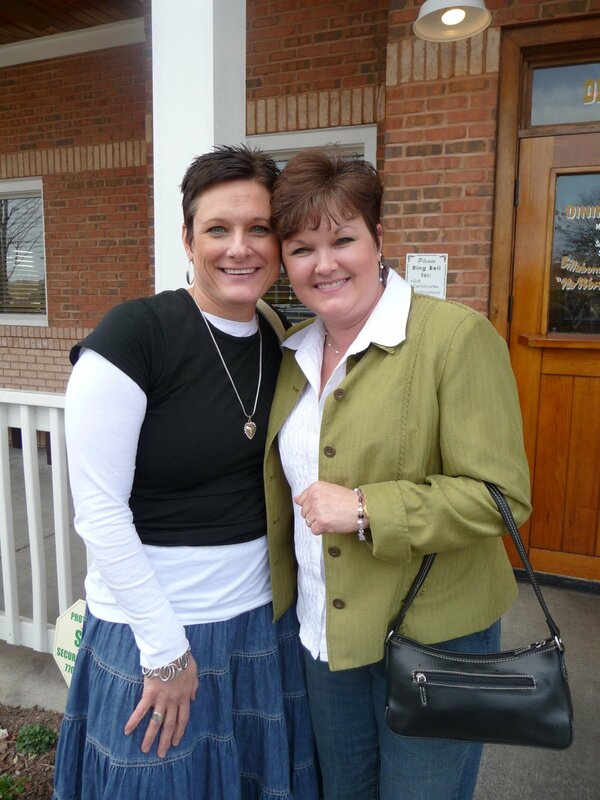 Marsha and I enjoyed a VERY LENGTHY lunch in North Carolina a few weeks ago! I can’t tell you when I have enjoyed anything as much as I did that day—and the day before meeting with my sweet buddy from Georgia! On a beautiful Sunday—during our vacation–the first leg of what was later dubbed as the “Angie Tour” was spent in the company of one terrific friend and her awesome family! We left there wanting to take the whole bunch with us! Lori—you are blessed with such beautiful “people”. We love you all! 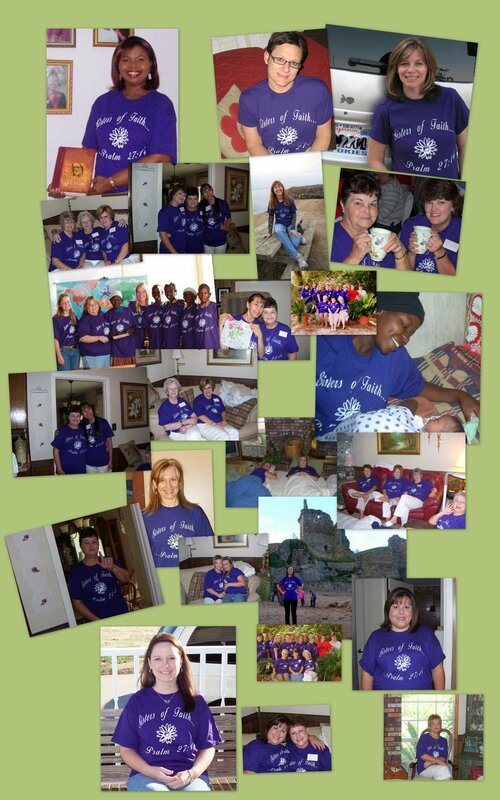 To see the pictures—click on the collage 🙂 Saturday was purple day! I wore my purple t-shirt to work! As did another co-worker. I saw many purple shirts this weekend—and smiled. Each one made me think of Wanda! She enjoyed her birthday with Jesus today. I know it was grand! I pray your Sunday is filled with HIS presence! See you next week! By the way—Jeff is brushing up on his next blog…but he won’t let me peek at it until it’s time for me to type it! 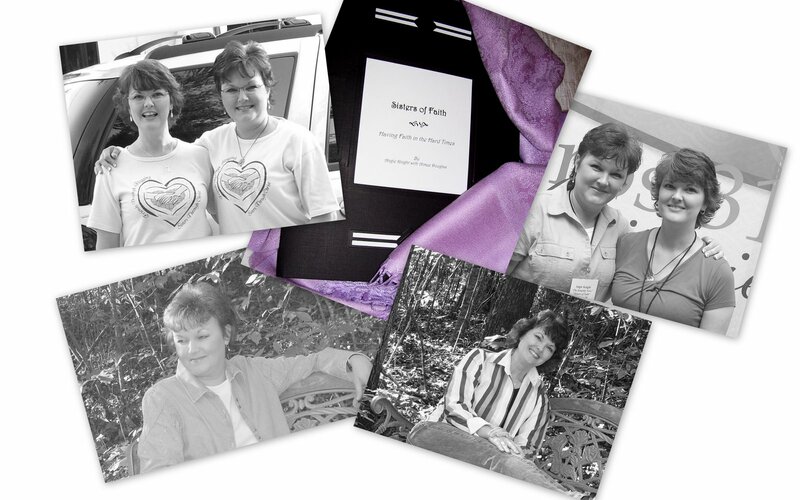 This entry was posted on Sunday, March 1st, 2009 at 12:44 am	and posted in For Sisters of Faith. You can follow any responses to this entry through the RSS 2.0 feed. « Thank the LORD it’s FRIDAY! Angie, this absolutely AMAZING!!! I have been out of the blogloop most of this week but was thinking of you, especially on Saturday. For us W. girls, Mr W’s birthday is much harder than any other date. I am in awe of how you chose to celebrate Wanda’s birthday this year. God is an AMAZING God and you are an AMAZING sister -I am proud to call you mine!!! Beautiful photos. It’s a blessing that you all have one another as sisters in the faith. Continue to keep one another encouraged and uplifted in the presence of the Lord as you share His love with others.Blessings and peace to you. Ang,This is a delightful post. Neat to look at the photos and I feel like I tagged along with you on this trip. Man, I could kick myself for not getting a photo short in my shirt. I am so sorry. You may not want one now, but I am going to shoot one off today and send it to you. Hugs. I love this post, made me smile really big. 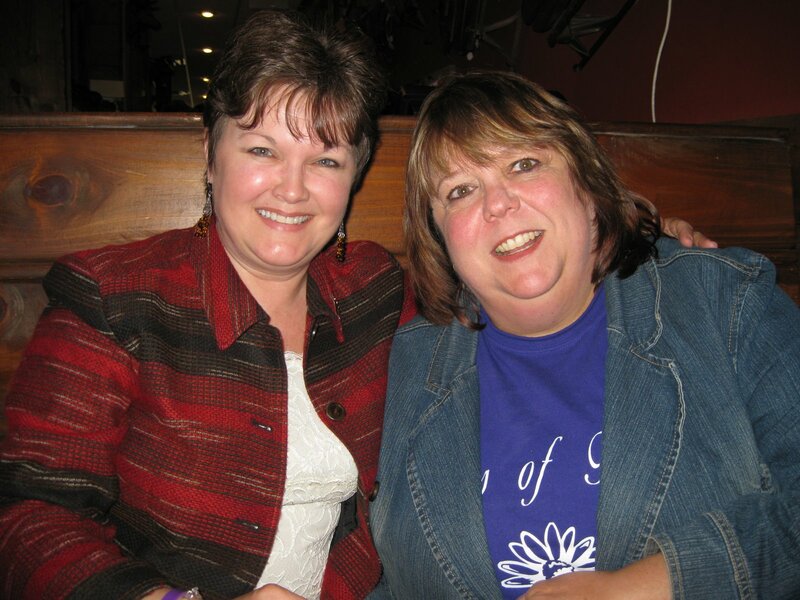 I wore my sisters of faith shirt on Saturday, to honor Wanda. Beautiful! Absolute amazing, dear Angie! Look how you and Wanda and Aimee touch us! God bless you sweeties. And I hope Wanda could see this love for her. Of course, she’s feeling more love than we can imagine….the love we are waiting for. Loved the pictures! What a legacy for the Sisters of Faith! Girlfriend…I’ve BEEN SOO BUSY…I JUST got to see this!! I want the bumper sticker…”I was part of the Angie TOUR!” When will they be printed?? ?Hey all those PURPLE shirts look go great! What a tribute to your sweet sister! I’m blessed to be a part of that!It was GREAT to give you a real life HUG….and I’m just HAPPY my assistant had a camera! !LOVE you!! !WE ALL do…LOL!! Beautiful Angie, it was great to look at all of the photos. You did such an awesome job putting them all together. God is just SO GOOD! WooHooo! I never knew I had so many!Wanda must LOVE this!!! Somehow I missed this post. I guess I was still in GA at the missions conference. I can’t wait to see what the Lord has next. hehehe!